Hi my name is RJ and I live in sunny Florida. I married my college sweetheart who was a pilot in the Air Force. We spent 30 years moving around the country during our 17 moves. We also got great opportunities to see a lot of Europe and Australia. It was a great experience that I miss now that we are retired. We have one grown son who lives in Texas. He stayed there for college while we had four new assignments and decided to make it his forever home. We go out to the Lone Star state as much as we can. I learned to stitch from another Air Force wife when I was in my late twenties. I stitched on and off for the next 30 years. We had some assignments that had great cross stitch stores and then others that did not have one single store of any kind. About five years ago I decided to make Noah’s Ark for a baby shower and realized how much I missed stitching. I found that now there are so many online sources and so many outstanding charts to choose from that there will never be a lull in my stitching again. 3. How long have you been blogging and what inspired you and Mary to start a joint blog? Right after making Noah’s Ark, I started looking for more charts to stitch. I found adorable Christmas ornaments by Little House Needleworks and started to mail them to Mary to see how she liked them. She loved them too. That is when I taught her to cross stitch through the internet. I mailed her a ton of supplies and she was off and running. Before long she was stitching on linen which she said she would never be able to do. From there, we both started finding blogs and they looked like so much fun. But both of us were kind of afraid to start one even though we really wanted to. One night I said “Why don’t we do one together”? She said yes and that is how Stitching Friends Forever got its start. It’s harder than it looks organizing two people but it’s also double the fun when it all comes together. For the most part I would call myself an OAAT. I like to be organized and plan ahead. This is a hard question because I like so many designers but I can’t resist With thy Needle and Thread patterns. My pocket book knows this even better than me. I also got to visit Shepherd’s Bush two years ago and was amazed at their talent. I just tackled my first larger kit of theirs and am totally hooked on their designs and all I’m learning about new embroidery stitches. The stitch I am most proud of and my very favorite is 'Tis the Season by Blackbird Designs. I fell in love with the beautiful red cardinal and the French writing. But a life circumstance that happened to me during the time I was stitching gave it exceptional meaning and a special place in my heart. 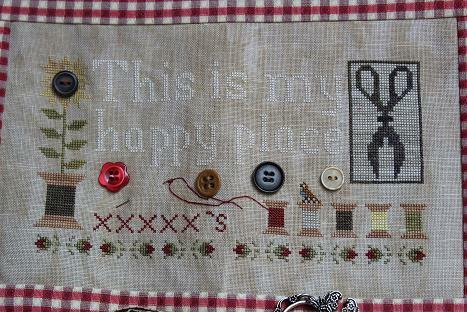 It is only stitched so far but will be finished later this year for a blog post. My worst disaster is the typical - a diet coke was spilled on it. We were leaving a base for a new assignment and would be staying with friends the last few days later in the week. I wanted to make them a nice farewell gift. I bought a chart about where you live. I totally charted it to fit the description of San Antonio and it was looking really good when the accident happened. Another friend was visiting with her little boy who knocked over the drink so I didn’t want to make a big deal of it while they were there. So it just sat with the stain. When they left, I rushed it to the sink and laid it in sudsy warm water. It was before overdyed threads so it did not run. Much to my surprise the coke stain all came out and the gift was saved. I would love to learn how to do cording and as many embroidered stitches as I can to vary my finishes. And, I’ve promised myself this year I will learn how to do a flat finish. I have a box of about 100 or so stitches that have not been finished. It is one of the main reasons I wanted to do a blog to push me to finish my stitches. Only problem is I keep starting new stitches for the blog. I really like to find new ways to finish stitches as I have little wall space. The first week of our blog we do a post on new finishes and this is my favorite week. 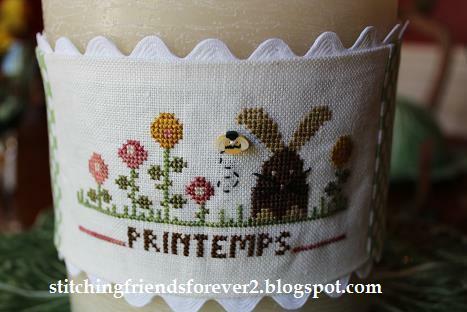 We have done things like pinafores, sewing machine covers and candle banners among others. I love patriotic stitches and because of our 30 years in the Air Force they probably most represent me. Lately a lot of people have asked Mary what is RJ’s real name. I have not been called this in 25 years but my real name is Roberta Jean. I had been called Roe, Rob, Bert, Berta and Bertie and really did not like any of them and then one day my husband said “How about RJ”? We were about to move to a new base and he began to introduce me as RJ and it has stuck. It sounds funny when friends we knew earlier in our life call me Roberta now. 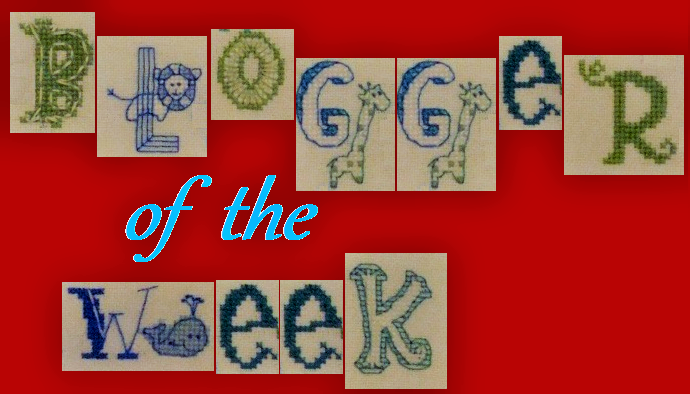 I would thank Jo so much for asking us to be bloggers of the week. It a honor to be considered. But more than that, I want to thank Jo for all the help she gave us when we were starting out. She taught me how to do our blog roll and also taught us how to not be no reply bloggers. She is a great teacher and I think could instruct anyone anything about blogging. For two novices like Mary and me we truly appreciated such expert help and friendship. Thank you RJ! It's a pleasure to help. Hooray, hooray! I loved learning a bit more about you my friend. Especially the Roberta Jean bit. ;) tee hee. Thank you Vickie. Now no calling me Roberta Jean my friend. Wonderful post. Now, I'm learning about more of you. 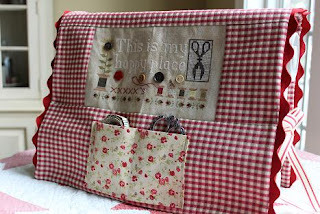 Great post, R.J. Lovely to learn more about you and your stitching and blogging life. You have so many gorgeous finishes. I wondered about RJ, nice to have the mystery solved! Loved learning more about you RJ and I look forward to reading many more of your blog posts! Maybe you need to squeeze in a "Finishing Week" somewhere in your posts so you can empty out your box of stitched pieces! Hello, nice to meet you. On my way over to visit your blog. This my third attempt to post a comment.I hope this one works.I really enjoyed reading more about you RJ and enjoying your beautiful stitching. Nice to meet you RJ! Hi, nice to meet you~ What a lovely collection of work you've got displayed. The sewing machine cover is quite wonderful. And a box with 100 finished but not finished! Oh that would drive me crazy ahaha. Hi RJ, nice to meet you! It must be so much fun to embark on that blogging adventure together with a friend. And Jo really is the grandmaster of blogs and a great teacher too! It's so nice to learn more about you RJ, and Jo is a gem, it's true! 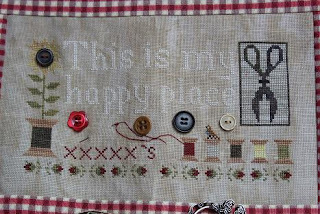 Sounds like you've lead an amazing life and stitched some amazing projects! And I'm with Tiff, Jo is my Obi Wan! Such an enjoyable interview, RJ (and Roberta was my aunt's name, too :). Always enjoy learning more about stitching friends and I look forward to the second half with Mary's interview next week! Lovely to meet you RJ. Your finishing skills are exceptional. Great post. Jo I can't say it enough this was a wonderful idea you had. Thanks for sharing RJ. RJ: Thank-you for a little history about yourself, it was a pleasure to read, I find I know you even better now. Your stitching is beautiful as well as the finishing. Thank-you for sharing with us a little corner of your life. 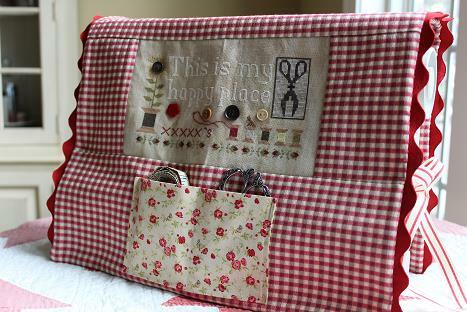 Lovely to read more about you RJ, you have stitched some wonderful iteams love the sewing machine cover and the pillow . So happy you and Mary joined us , and yes Jo is a wonderful and so helpful and kind . Very interesting to read how you and Mary decided to start your joint adventure. That was a great idea, I love your blog. And now the secret about your name is no secret any longer, lol. So nice to read your interview. love hearing from one of my favorite stitchers! pardon the one handed typing....still dealing with broken wrist. reading about stitching and seeing stitching on floss tube is getting me through this little trial. So many beautiful pieces here!AriadnefromGreece! 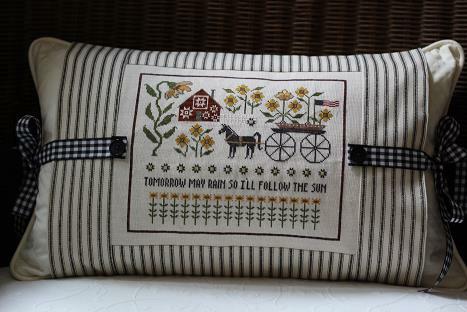 I love all your stitching, and all the different ways you finish a project. You do great work. enjoy your day.